Free download Docs Viewer v10.2.1 apk for android from revdl.com. 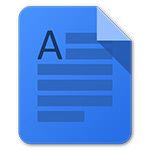 ocs Viewer allows you to use Google Docs to quickly view documents on Android, including PDFs and Microsoft Office Files. An internet connection is required. Docs Viewer integrates directly with Android’s Internet Browser, Email Clients, File Managers, and apps such as Google Drive and Dropbox. There is a 10 MiB limit to files uploaded from your Android device. Files from other sources can be much larger.